What Grinch Killed The World’s Largest Manufacturer of Toys? A cold winter’s day, a Christmas tree & an electric train set! Wow! Big fun! A cold winter’s day, a Christmas tree, and a box of toys. What could be more fun, huh, kids? Especially if the box is full of electric train stuff. Maybe you have to be a kid of a certain age to be able to experience the rush of opening a box that says, “Marx Electric Train” on it. The box says, “Louis Marx & Co., Inc., 200 Fifth Avenue, New York, N.Y., U.S.A.” And, at the time this particular train set was made – more than a half century ago now, Marx was the “World’s Largest Manufacturer of Toys”. Where is it today? Gone. In fact, it’s deader than the mimeograph industry – and has been for more than 30 years. How did it go from the world’s largest toy company, to nothing, so quickly? Only in America, where, to paraphrase a recent Saturday Night Live skit, the only thing we make anymore is Type II Diabetes. During the Great Depression, Marx sales actually grew. At its peak, Marx had three huge factories in the U.S. (Glen Dale, W.Va.; and Erie and Girard, Pa.) and numerous factories overseas. Its rather legendary 1948 Hudson Hornet, made with help from Hudson’s own engineers, looks a lot like the inspiration for “Doc Hudson” in the movie “Cars”. Marx’ most famous automotive-based toy, however, was the ubiquitous “Big Wheel”. Other Marx specialties? The yo-yo, boxed “Play Sets” and Rock ‘Em Sock ‘Em Robots. But Marx was slow to fend off competition. Despite a big head start in the diecast toy car field, Mattel soon caught up and passed Marx. Though Marx offered a line of “Elegant Models” (like most Marx creations, now much prized by collectors), Matchbox and Mattel’s Hot Wheels ate its lunch. Marx also did not devote a lot toward advertising. In 1955, for instance, when Mattel spent $500,000 on advertising, Marx spent $312. Mattel also sponsored the new “Mickey Mouse Club” program on television. By 1972, with Marx then 76, he unloaded his company for $54 million to Quaker Oats. Quaker, which owned Fisher-Price at the time, thought they’d know how to make something out of it. But its plans turned to mush (pun intended). By 1980, the whole thing had been mismanaged into oblivion, tens of thousands of American workers were out of a job, and the plants all closed. Glen Dale is still the site of a Marx toy museum. Bits and pieces linger on. Original Marx tooling and molds are still used to produce replacement parts for the old train sets. Trademarks and logos have been auctioned off. And a Cedar Rapids, Iowa, company now makes the Big Wheel. 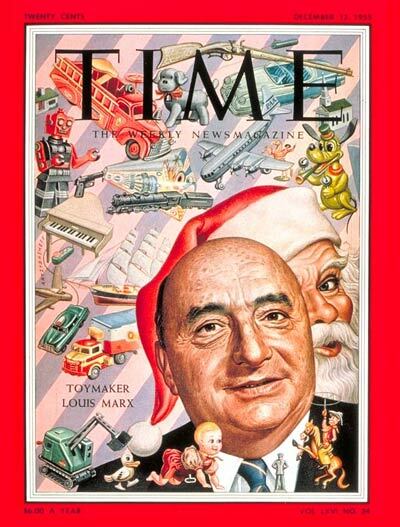 Louis Marx, who fathered nine children with two wives, died at 85 in 1982. His huge, historically significant Scarsdale, N.Y., mansion, built in 1904, was demolished by a housing tract developer earlier this year. The toy company that Louis Marx built is gone, but the toys he gave us will live on – as long as there are kids to play with them. Hi David. I’ll send you an email. Thanks. The popularity of the Marx Company declined in the 1950s. Some speculate the company’s downfall was brought on by not fully taking advantage of television as an advertising medium. While much smaller rival Mattel Toys spent $500,000 on television advertising in 1955, including sponsoring The Mickey Mouse Club, Marx spent only $312. Marx also failed to catch on to the electronic toy trend in the early 1970s.